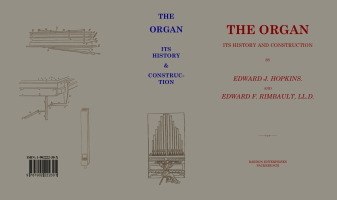 Its History and Construction - A comprehensive treatise on the structure & capabilities of the organ by Edward J. Hopkins. Preceded by an entirely New History of the Organ by Edward F. Rimbault, LL.D. Description: This book contains a History of the Organ by E. F. Rimbault, followed by a comprehensive treatise on the construction of the Organ by E. J. Hopkins; with an appendix of 342 specification of Organs, together with a list of foreign and English equivalent terms. The main sections included in the history are: The Ancient Organ; the Mediæval Organ; the first Organ-builders; and the founders of modern Organ-building. The main sections of the construction are: The exterior; the wind-collecting portion; the wind-distribution portion (sound-board, the table, &c); the mechanism; the sound-producing portions; tuning and temperament; common faults; and suggestions for the construction and erection.